The U.S. equity markets are the largest and most liquid in the world. Their health has a direct impact on the ability of emerging and growth companies to raise funds and to have successful exits. Therefore, it is important to understand their status in relation to the business cycle and secular trends, and near-term risks that might affect planned financings, IPOs and M&A. The U.S. equity markets reached record levels starting in December 2016 and continuing into 2017. As of mid-February 2017, the major indices — the Standard & Poor’s 500 index, the Nasdaq composite and the Dow Jones industrial average — set new all-time highs. The records were driven by strong fourth-quarter corporate earnings and anticipation the new President and Congress will enact fiscally stimulatory policies, including substantially higher infrastructure spending, lower corporate and individual taxes and eased regulations for companies across many sectors. The strong performance of the major indices stands in contrast to a rather dreary year for IPOs. In 2016, 105 IPOs raised roughly $20 billion, among the lowest levels in the past decade, and under 2015’s 174 IPOs that raised over $34 billion. While a few companies such as Twilio (TWLO), Line (LN) and Nutanix (NTNX) had successful initial offerings, many others chose to exit by M&A instead. The tumultuous first few weeks of the Trump administration has increased an already high level of uncertainty created by a variety of domestic and global political and economic factors. Nevertheless for IPOs, the new year has indicated a potential uptick as several companies launched or priced their IPOs in January, and the backlog continues to grow. The most notable is Snapchat’s parent’s filing to go out at a valuation of $20 – $22.5 Billion. The number of new IPO filings is especially impressive in light of recently enacted new rules that allow for a higher number of shareholders before a company must go public. Such rules have enabled Uber, for example, to remain private despite having a huge valuation and public commercial presence. Trump has already held a widely covered meeting with the current titans of Wall Street to confirm his announced intention to loosen significantly the Dodd-Frank Act regulations enacted in the wake of the 2008 financial collapse. The impact appears to be positive for IPOs and the equity markets in general as financial stocks have seen substantial recent gains. The strength in financial stocks may support other equity issuances. In addition, permitting banks to go back to trading high-yield bonds and underwriting them for more highly leveraged companies will likely strengthen the M&A environment by increasing private equity activity. Nearly all observers agree corporate tax reform is sorely needed in the U.S., but its ultimate form is impossible to predict. At this point, the most likely outcome is probably to have a positive, possibly significant impact on the equity markets. Supportive policies would be a reduced tax rate for repatriated corporate cash held abroad, now widely estimated at a stunning $2.5 Trillion; permission to expense rather than to depreciate capital investments over several years; and, of course, a lower federal corporate tax rate, now among the highest of developed nations. During the campaign, and now in office, the Administration has promised large investment in basic infrastructure, such as transportation, energy and other core sectors. These would amount to a large fiscal stimulus, which could improve corporate profits and result in higher stock prices for the firms likely to get large government contracts. Quarterly earnings for technology companies were generally good in the fourth quarter of 2016, and the trend is expected to continue into this quarter. It remains unclear whether VCs and PE firms will choose to exit by IPO or sale of the companies. But the growing view that the long economic expansion is in its final phase, the predisposition of decision-makers is likely to favor IPO exits before the year runs its course. Many of the Administration’s most senior members have had successful careers on Wall Street. They are likely to favor policies supportive of a robust trading and M&A environment, which they would see as an indicator of economic health. Technology companies will play a large role in any resurgence of the IPO market. Snapchat’s parent’s recent filing to go public may encourage others to do the same should it be seen as successful. There are many brand-name software and Internet companies eligible for large initial offerings, such as Spotify, Palantir, Uber, Lyft, Airbnb and Dropbox among others. High activity in the IPO market will engender more activity in the private market as investors will take advantage of good valuations and opportunities to exit. Be prepared for an active year in financings and exits! MWC has shown IoT is everywhere. Large players like IBM, Microsoft offer generic platforms to the market, formally vertical players like GE open their platform to the world and across industries all makers IoT-inze their gear, machines and solutions. At present there are competitive offers across all solution value chain parts, multiple sensors, multiple IoT devices, a variety of connectivity standards (Wifi, LoRa, 5G, …), a plentitude of connectivity providers, generic and dedicated platforms, market places for apps and lots of PoCs to create value from IoT and its data. So where is this plethora heading ? 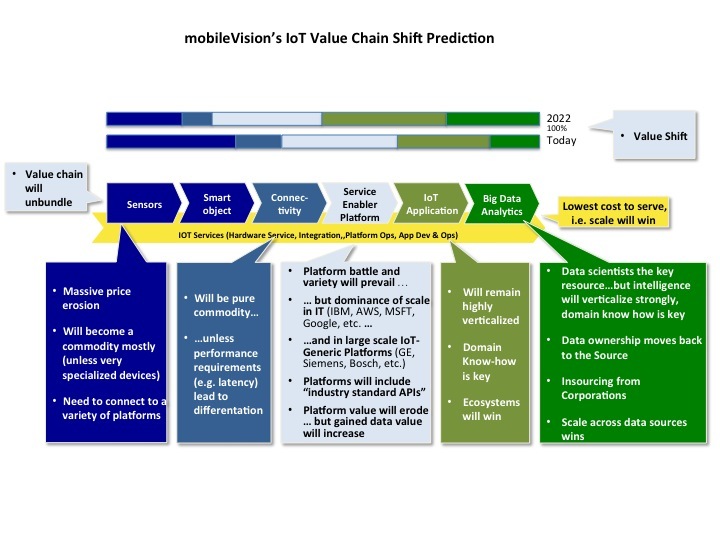 mobileVision believes that the overall value chain will drastically evolve and the player landscape will consolidate rapidly, the value provided will also change over the next years. Key trends predicted are highlighted in our chart, your feedback is welcome !